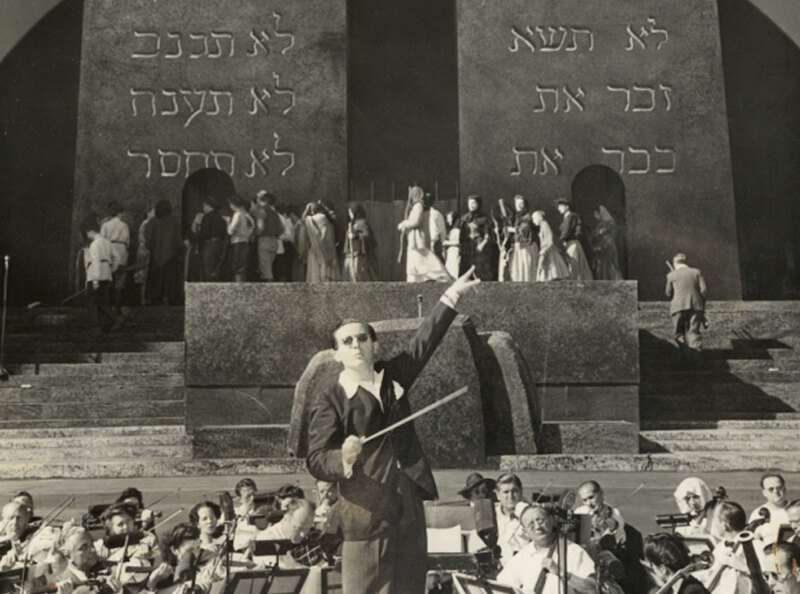 German born, American-Jewish composer, Franz Waxman conducts a rehearsal of the "We Will Never Die" pageant in the Hollywood Bowl. Hollywood, CA, 1943. — Courtesy of John W. Waxman. The dramatic pageant "We Will Never Die" premieres before an audience of 40,000 at Madison Square Garden to raise public awareness of the mass murder of European Jews. In early 1943, a Gallup poll asked Americans: "It is said that two million Jews have been killed in Europe since the war began. Do you think this is true or just a rumor?" Although the Allied leadership had publicly confirmed that two million Jews had been murdered, the poll found that only 47 percent of respondents believed it was true, while 29 percent dismissed it as a rumor; the remaining 24 percent had no opinion. Ben Hecht, the newspaper columnist and Academy Award-winning screenwriter (Gone with the Wind, The Front Page, Scarface), responded the only way he knew how: He picked up his pen and began to write. Determined to alert the American public to the Nazi slaughter of the Jews, Hecht authored a dramatic pageant that he called We Will Never Die. Working with Peter Bergson (real name: Hillel Kook), a Zionist emissary from Palestine who had established a political action committee to lobby in Washington, Hecht secured support for the project in Hollywood and on Broadway. Edward G. Robinson, Paul Muni, Sylvia Sydney, and Luther Adler starred in We Will Never Die. Moss Hart directed it, and Kurt Weill composed an original score for the event. Local stars took part when the pageant was staged in various cities. With its cast of hundreds, We Will Never Die would be an extraordinary production in every sense of the word. We Will Never Die debuted to audiences of more than 40,000 in two shows at Madison Square Garden on March 9 and March 10, 1943. The event received substantial media coverage, carrying its message to audiences well beyond those who actually attended the pageant. During the spring and summer of 1943, Peter Bergson’s group intensified its campaign of newspaper ads, public rallies, and lobbying on Capitol Hill. It also continued to stage We Will Never Die in five major cities. Washington, DC, Constitution Hall (April 12, 1943). First Lady Eleanor Roosevelt, six justices of the Supreme Court, more than two hundred members of Congress, and numerous members of the international diplomatic corps were in attendance. Mrs. Roosevelt was so moved by the performance that she devoted part of her next syndicated column, “My Day,” to the pageant and the plight of Europe's Jews. Philadelphia, Convention Hall (April 22, 1943). Claude Rains and Edward G. Arnold performed the lead roles. It was the largest Jewish public event in the city in many years. Chicago, The Stadium (May 19, 1943). John Garfield and Burgess Meredith performed the lead roles. An estimated 20,000 people attended. Boston, The Garden (June 6, 1943). Ralph Bellamy, Lionel Atwill, and Howard Da Silva had prominent roles. Los Angeles, The Hollywood Bowl (July 21, 1943). The climactic performance included an audience of prominent Californians, among them Governor Earl Warren, Bishop W. Bertrand Stevens, and numerous Hollywood actors, writers, and producers. The same week that We Will Never Die was performed in Philadelphia, representatives of the American and British governments were meeting in Bermuda to discuss the Jewish refugee problem. Despite 12 days of discussions, the conference produced no concrete plans for rescue. This lack of action aroused outrage throughout the American Jewish community and on Capitol Hill. Capitalizing on publicity from We Will Never Die, newspaper ads, and other protest activities, Peter Bergson persuaded leading members of Congress, in October 1943, to introduce a resolution urging the creation of a US government agency to rescue Jewish refugees. It quickly passed the Senate Foreign Relations Committee and was the subject of hearings before the House Foreign Affairs Committee. The hearings on the rescue resolution set off a firestorm of controversy when a State Department official presented testimony that wildly exaggerated the number of refugees who had already been permitted to enter the United States. Meanwhile, just as the refugee controversy was making headlines, a group of senior aides to Treasury Secretary Henry Morgenthau, Jr., were uncovering a pattern of attempts by the State Department to obstruct rescue opportunities and block the flow of Holocaust information to the United States. Armed with this information, Morgenthau went to the president in January 1944 to warn him that the refugee issue had become "a boiling pot on [Capitol] Hill" and Congress was likely to pass the rescue resolution unless the White House acted. Roosevelt pre-empted Congress by establishing the new agency that the resolution had sought—the War Refugee Board. March 9–17, 1943 News articles, editorials, opinion pieces, letters to the editor, and cartoons regarding the New York performance at Madison Square Garden. April 12–20, 1943 News articles, editorials, opinion pieces, letters to the editor, and cartoons regarding the Washington, DC, performance at Constitution Hall. April 22–30, 1943 News articles, editorials, opinion pieces, letters to the editor, and cartoons regarding the Philadelphia performance at the Convention Hall. May 19–27, 1943 News articles, editorials, opinion pieces, letters to the editor, and cartoons regarding the Chicago performance in the Stadium. June 6–14, 1943 News articles, editorials, opinion pieces, letters to the editor, and cartoons regarding the Boston performance at the Garden. July 21–29, 1943 News articles, editorials, opinion pieces, letters to the editor, and cartoons regarding the Los Angeles performance at the Hollywood Bowl. October 1943–January 1944 News articles, editorials, opinion pieces, letters to the editor, and cartoons regarding the Congressional testimony and debates, as well as the eventual passage of a Congressional resolution calling for US government action to rescue European Jews. Citron, Atay. "Pagentry and Theatre in the Service of Jewish Nationalism in the United States, 1933–1646." PhD dissertation, New York University, 1989. Hecht, Ben. A Child of the Century. New York: Simon & Schuster, 1954. Hecht, Ben. We Will Never Die. Two unpublished versions of the script bearing Weill's annotations. Weill-Lenya Research Center: Series 20 and Yale Collection, folder 475. Peck, Sarah E. "The Campaign for an American Response to the Holocaust 1943–1945," Journal of Contemporary History 15, 367–400. Penkower, Monty N. "In Dramatic Dissent: The Bergson Boys," American Jewish History 70, 281–309. Whitfield, Stephen J. "The Politics of Pageantry, 1936–1946." American Jewish History 84, no. 3 (1996): 221–251. Wyman, David S. and Rafael Medoff. A Race Against Death: Peter Bergson, America, and the Holocaust. New York: The New Press, 2002.